Regular readers might remember that I first attempted to review Brewdog about three months ago, unsuccessfully as it happens. I came, I saw, I was told they couldn’t even take orders for at least thirty minutes and I sodded off. To the Real Greek instead, in fact, where I had a surprisingly enjoyable meal with my friend Steve. He still messages me occasionally just to talk about sausage (the one at the Real Greek I should say, although I think Steve has a soft spot for most sausages, so to speak). 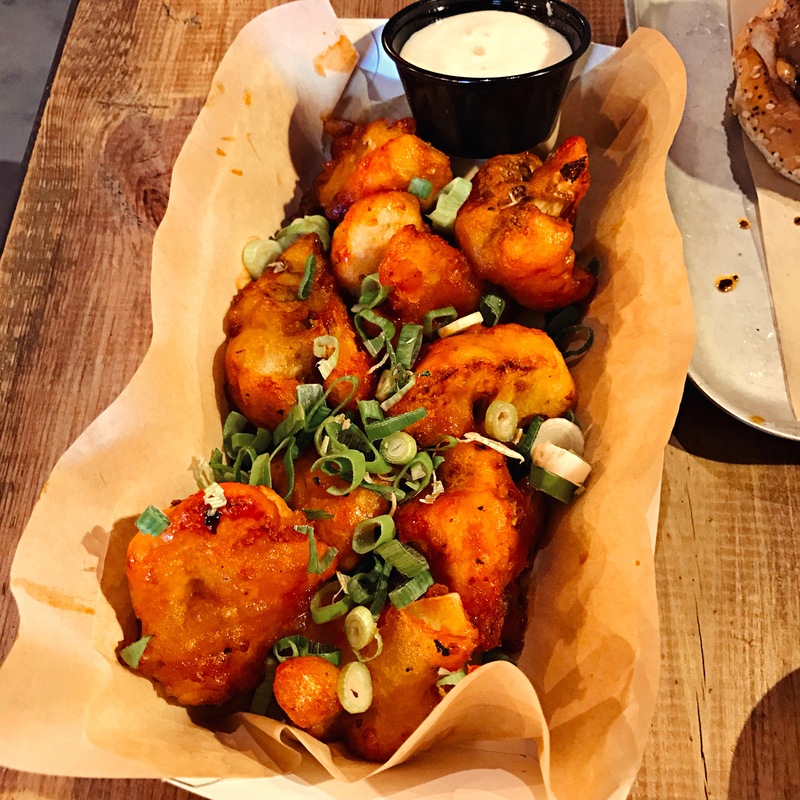 I decided I would leave Brewdog for another day when my frustration had subsided and I’d forgotten some of the faux wackiness which had slightly got my back up – the almost illegible menu and the zany pun-ridden dish names like “Hail Seitan” and “Clucky This Time”. So I turned up with my old friend Mike on a Monday night to check it out, hoping for better luck this time. Much was different from my last visit. 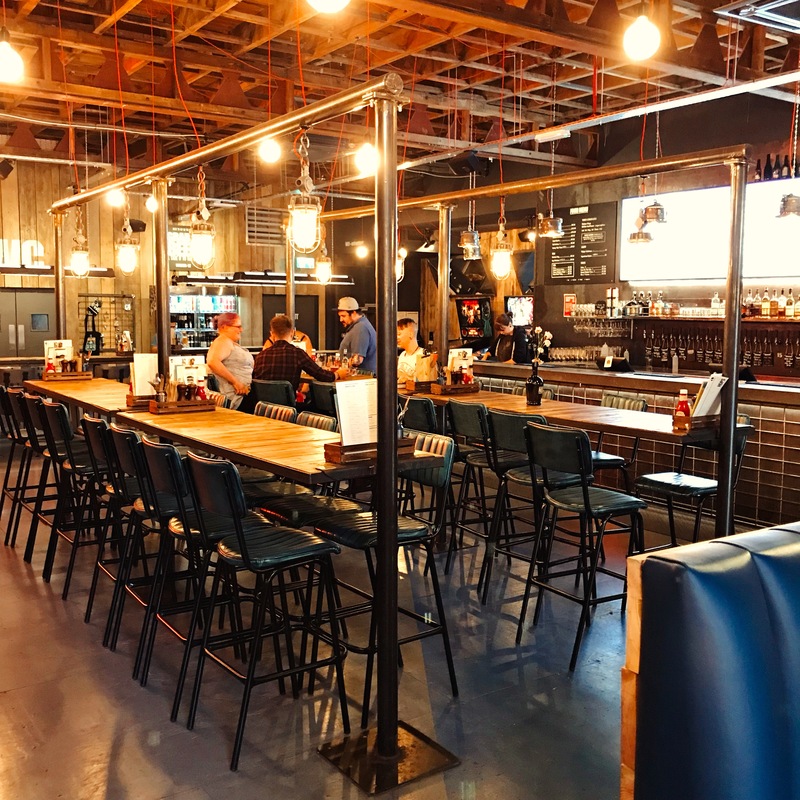 In May, Brewdog had been open less than two months and there was still a huge buzz about the place. It had been fuller and louder, whereas going back now it was definitely a quieter proposition – although that might also be because I went on a Monday. Another difference was that last time I turned up on spec, whereas this time I had had already booked a table. The site has a chequered history. It’s been the Litten Tree, a properly purgatorial chain pub known to many Reading residents of a certain vintage as the “Shitten Tree”. It’s been RYND, with beautiful interiors, rock-hard cheap seating and bandwagon-chasing knock-off American barbecue food. And most recently it’s been Public, a venue whose selling point – if you see this as a selling point – was to have board games, fussball tables and pool tables. I imagine the trendsetters went there but wouldn’t have been seen dead in the Sun, on the opposite side of the road, with its thoroughly charming bar billiards table: nowhere near ironic enough. RYND, for all its faults, did a beautiful job of exposing the brickwork and then Public cocked it all up with cheapo tiles and wood panelling, so it was lovely to see that Brewdog had restored the room to something like its former glory. The large central room does feel like a beer hall, with long tables and – no surprises here – industrial light fittings. I’d asked for a booth, and it would have been nice to have been seated at one of the ones in the main room to feel more like part of things, but instead they put us in the smaller area off to the left, very much the overflow car park of the restaurant. On my last visit, poor Steve and I waited at our table in bewilderment for easily five minutes before realising that nobody was going to come to ask us what we wanted. At the time, I wrote this off as my mistake, thinking that Brewdog was far more like a pub than a restaurant. But another difference with this visit was that a very friendly, smiley waitress came over and asked us what we’d like to drink. I have no idea whether that’s because it was quieter, or because we’d booked a table or for some other reason, and it slightly bugs me that I can’t tell you which of my two visits was more representative. The menu was, well, burgers and hot dogs. And two salads. I couldn’t help thinking that Brewdog might have put more effort and imagination – albeit misplaced – into the names of the dishes than the dishes themselves. I had my eye on a burger from my extensive research – the “Jackpot”, with its winning combination of black pudding, chorizo and blue cheese – but I was also determined to let Mike pick first. I’m lucky that people want to come out on duty with me, so I always try to make sure they aren’t eating their second choice of starter or main. “I quite fancy the ‘Chipotle Chorizo’,” said Mike, which made perfect sense: his mum is Spanish, after all. My first choice of chicken burger would have been the “Buffalo Chicken”, but we’d also decided to have some of the buffalo cauliflower, so I ended up going for the “Cluck Norris”: southern fried chicken and avocado. I had a sneaking feeling I had picked the menu’s equivalent of a chicken korma at this point, but the die was cast. Besides, why whinge about it to Mike when I could bide my time and instead complain to literally dozens of readers? Think of the delayed gratification, I told myself as I drank my pint. I suppose I should at least attempt to talk about the beer, so here goes: there are a whole range of Brewdog beers on tap along with others in bottles and a range of other guest beers. Nearly everything crosses the five pound a pint Rubicon which, in fairness, probably stopped being any kind of meaningful threshold at some point last year; nowadays you just pay whatever they charge you and if you wince when they tell you how much your round is, you’re either in the wrong place or pubs just aren’t for you. The menu helpfully made suggestions about which beers paired well with each burger (Mike followed this advice, because he’s that kind of person and I didn’t, because I’m not). Mike declared himself very satisfied with the Punk IPA and the Dead Pony, the latter specifically chosen to go with his burger. “They sell Brewdog on the continent”, he told me (Mike spends most of the year swanning around Europe running coach tours: I like to think he’s like a twenty-first century Robin Askwith, although the lack of stories of swordsmanship suggests this might be wishful thinking), “but it’s really expensive over there.” The punchline was left hanging in the air: I couldn’t be bothered to claim it. My beers, from the outer reaches of the list, were more interesting I thought, although that doesn’t guarantee that my descriptions of them will be. I had a pint of Lighthouse by Windswept which I really liked, a “Kolsch style lager” (it means it’s kind of German, apparently – you know, like the Royal Family) which was crisp, clean and just the right side of the dividing line between bland and delicate. The Windswept website says it’s best enjoyed after abseiling or archery, which strikes me as a shame because it means I’ll never get to enjoy it in optimum conditions: never mind, I’ll live. I followed it up with a pint of “#MashTag2018” which seems to be a beer that’s part crowdsourced through polls every year. The 2018 version, which presumably was chosen by Russian bots, was infused with hibiscus and yuzu and I liked it a great deal; the sharp citrus added by the yuzu made it smarter than the average beer. Mike had a sip and decided to order a pint of himself after he’d lapped me. He then decided that it was more fun to sip a little of it than to wade through a pint of it, which I figured served him right. Karmic payback for stopping me hitting the Jackpot, perhaps. 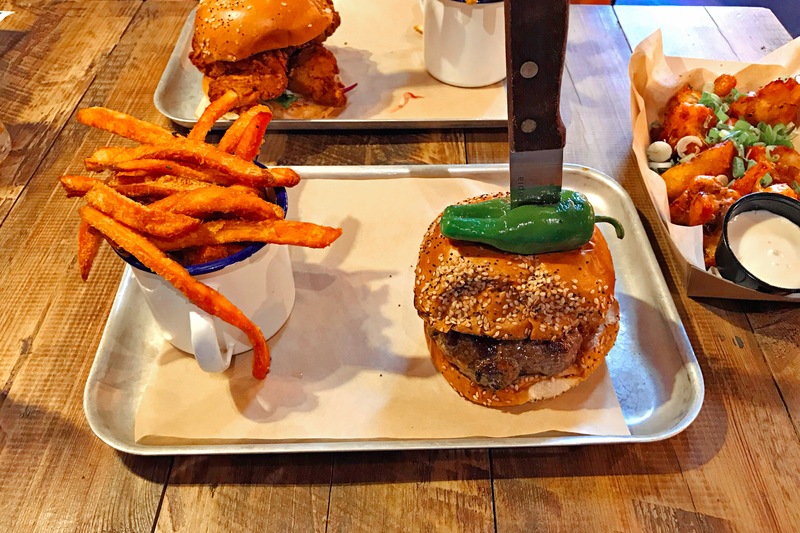 The burgers at Brewdog cost between nine and ten pounds and fries (or sweet potato fries) are extra, so in terms of price it’s probably largely on a par with Honest. It’s taken me until this point in the review to mention the H word, but they were very much in my mind as I had my dinner because, for better or worse, 2018 is the year that they’ve become the benchmark for all burgers in this town. Here’s something you’ll rarely hear me say: the problem with my chicken burger is that it had too much chicken. It’s honestly true – the unremarkable-looking seeded brioche had two large coated chicken breasts in it. That might have been a dream come true if the coating had tasted of anything, but in fact it had almost no flavour at all. A real shame, because it looked the part and the texture was great, but in terms of taste it was like a mirage of KFC. This also meant that the whole thing was unbalanced because the things it really needed – the avocado, the coriander, the Cajun mayo – simply couldn’t put up a fight against all that bland fried chicken. With proper coating, less chicken and more of the rest it could have been world-beating, but as it was I actually left some of it. A knife stuck needlessly out of the top, Excalibur-style, and I couldn’t tell whether it was decoration or punishment. Mike’s “Chipotle Chorizo” was better, but still unspecial. The burger itself – very much cooked medium-well – was crumbly and dry and left me, again, thinking wistfully of Honest at the other end of town. The chorizo was by far the best thing in it – coarse, juicy and piquant – but the chipotle mayo didn’t add a lot and the padron peppers felt a bit random. There was one in the burger and another impaled on top of the bun – that knife trick again. I felt like Mike had got the better deal, but only in terms of shades of meh. Speaking of meh, the fries were wan and disappointing, and I didn’t have any desire to finish them all. 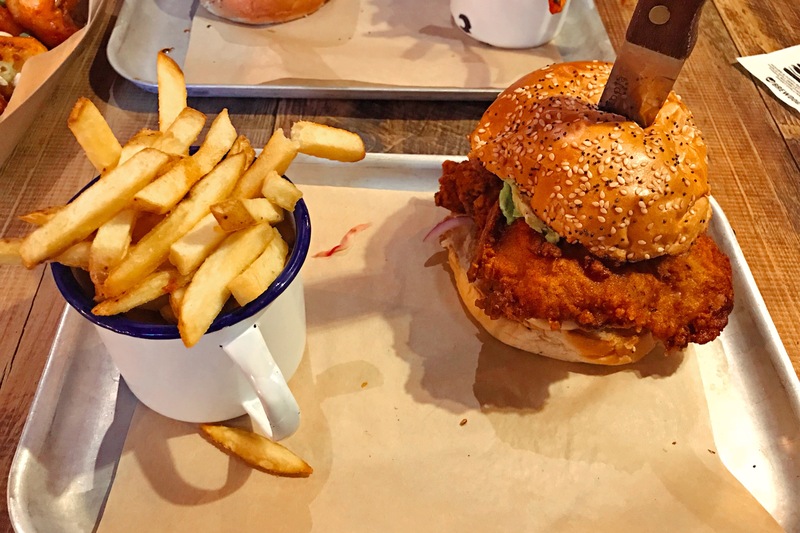 Mike had upgraded to the sweet potato fries – they cost fifty pence extra – and this was money well spent, although probably money better spent would have involved not having fries at all. The bright spot was the buffalo cauliflower, which we both agreed was quite the nicest thing we ate all evening. Big firm florets in a hot, sour glaze, and easily more interesting than the feature attraction, a scene-stealing bit part. But even this wasn’t perfect – I liked the coating but I’d have liked it to be crunchier and stick to the cauliflower a bit better. And, when it came to it, we paid eight pounds for it, so it really wasn’t much cheaper than the burgers. Perhaps by this point I’d just run out of magnanimity: it’s distinctly possible. There was a vegan dip with it, which tasted like a photocopy of salad cream and might have appealed, if you were a vegan. This is all getting a bit crotchety, isn’t it? I should perhaps focus on the service because it was properly lovely. Our waitress (or, according to the bill, “server”) was likeable and cheery without ever seeming fake or making us feel like miserable old shits, not that we needed any help in that department. Our bill for two came to just shy of sixty pounds, excluding service (and the menu, randomly, also gives you the option to buy a pint of Punk IPA for the kitchen: I’m not sure that would have improved matters, but it might have been worth giving it a whirl). At the time that didn’t feel like a lot, but looking back it feels like money extracted somewhat by stealth. It’s probably obvious by now that Brewdog wasn’t my bag at all, but what surprises me is that I honestly expected it to be better. It has a small menu and I thought sticking to a few things might mean they did them well, especially when you think about how considered their brand is and how much attention to detail they’ve put into the building, and the fit out. So it’s disappointing that the food was so drab; if I wanted that kind of meal I’d go to Honest, and if I wanted that range of beer I’d walk slightly further out of town and make for the Nag’s Head. Of course, it’s possible that Brewdog was aiming for the sweet spot on the Venn diagram where beer drinkers and food fans meet, but somehow I doubt it. It felt like the food was just there to tick a box rather than to properly complement the beer, and I found that a little sad. It felt a lot like a slightly less corporate Oakford Social Club, but when you strip away the beards the experience is much the same. What Brewdog really highlighted, for me, is one of the big gaps in the market left here in Reading. Since I Love Paella left the Fisherman’s Cottage, punters have been left with a pretty stark choice: you can have a fantastic range of well-kept beer or you can have brilliant food, but – for now at least – you can’t have both. You can buy Brewdog beers in Seoul, too!